The Settlement in Heber Springs Arkansas is a great place to live. The accommodations are spacious, beautifully decorated and comfortable. 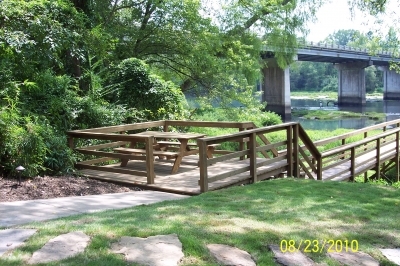 The location is great, close to shopping, places to eat and best of all right on the banks of the Little Red River. The management has been super to work with and extremely thoughtful in checking to make sure everything is satisfactory. I have been very pleased with my stay at the condominium provided by Vista Properties. I am most impressed with their proactive attitude and followup with repairs. Vista took the initiative with the replacement of the cracked tile in the kitchen and replacement of the tile in the entry. However I was most impressed by the fact that while a representative of Vista was taking care of a plumbing problem, water was noticed leaking out from under the washer, There was a major leak which necessitated repairs being made and water being removed from my carpet. This was all taken care before I knew of the problem and prior to my return that evening. With regards to your request for a testamonial about Vista Investment properties, I certainly have nothing but praise for my treatment since I've been with you. It's refreshing to be treated like an adult in this environment. You seem to share my creed of "Treat others as I like to be treated". "My husband and I are very happy with Vista Properties. The home we live in is beautiful and well kept. The home was well furnished and decorated very nicely. We have both said since moving from our previous rent house that this felt much more like a home. We have been very pleased with the prompt response given by Vista Properties when requests have been made regarding things at the house. Given the opportunity, we would certainly rent from Vista again." Deb --Just wanted to give you notice that my job here will be ending in about 60 days. Not sure a specific date but will know more next week. I have really enjoyed living in the Condo and have been very happy with your management of the space. Your patience with me at times has been greatly appreciated. I would recommend Vista Properties to others looking for a space to lease. I hope all is well with you. I just wanted to thank you and Bruce for taking care of me for a few years while I was "visiting" Heber Springs. It was nice knowing that if something needed fixed or replaced, or insect exterminations or basically anything else, it was taken care of quickly and nicely. It certainly made it easier for me knowing that things were being taken care of so I didn't have to deal with it. Please tell Bruce hello and I look forward to visiting Heber Springs again - albeit for a much shorter duration! Take care and good luck in your endeavors. My husband's employer which is an oilfield service company, has leased a house at The Settlement in Heber Springs, Arkansas for the past three years and we have been thoroughly satisfied tenants with the location, service extended to us and communication with Bruce, Bobbie and Deb. The property with its spacious rooms and updated amenities exceeds any expectations of a river cabin with its easy access for fly fishing on The Little Red River and we as well as our sales staff and customers have enjoyed many fun times at cabin #14. Thank you for allowing us to express our gratitude.